In the submandibular region there are 2 pairs of large salivary glands. These are called submandibular and sublingual salivary glands. The first lies primarily below the floor of the mouth and the latter above the floor of the mouth. It is among the 3 pairs of matched salivary glands. This salivary gland, is situated partly below and partly deep to the posterior half of the mandible and is large, in regards to the magnitude of a walnut. It weighs about 10-20 grams and is half the size of the parotid gland It’s mostly serous, but it is a combined type of gland (which is both mucus and serous in nature). It is composed of 2 parts: (a) a large superficial part and (b) a small deep part. 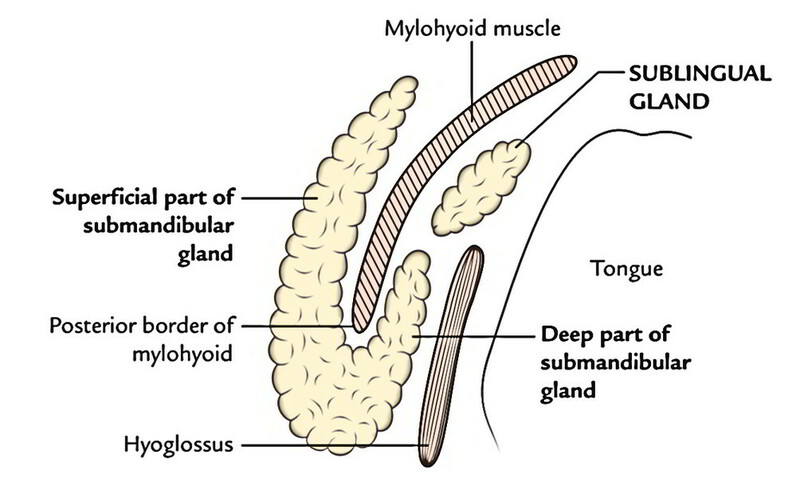 The superficial part is located superficial to the mylohyoid muscle, while deep part is located deep to the mylohyoid muscle. The 2 parts are constant with every other around the posterior border of the mylohyoid muscle. This part of the gland is very large and fills the anterior part of the digastric triangle stretching upwards up to the mylohyoid line. The superficial part presents 2 ends- anterior and posterior and 3 surfaces- inferior, lateral and medial. The anterior end goes up to the anterior belly of the digastric muscle. 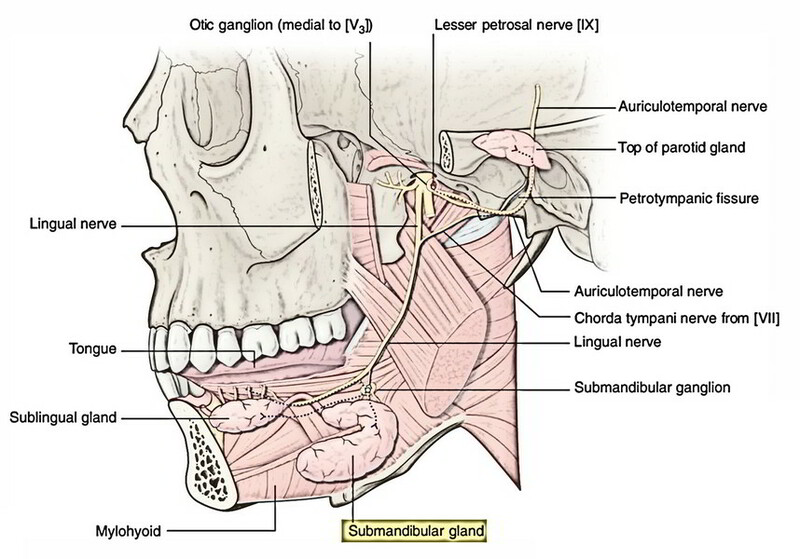 The posterior end goes up to the stylomandibular ligament, which divides the submandibular gland from the parotid gland This end presents a groove made by ascending limb of the cervical loop of the facial artery. The superficial part is partly enclosed between both layers of investing layer of deep cervical fascia. At the greater cornu of hyoid bone the investing layer of deep cervical fascia divides into 2 laminae to enclose the superficial part. The superficial layer covers the inferior outermost layer of the gland and is connected to the base of the mandible. The deep layer covers the medial outermost layer of the gland and is connected to the mylohyoid line of the mandible. Superficial fascia comprising platysma and cervical branch of facial nerve. 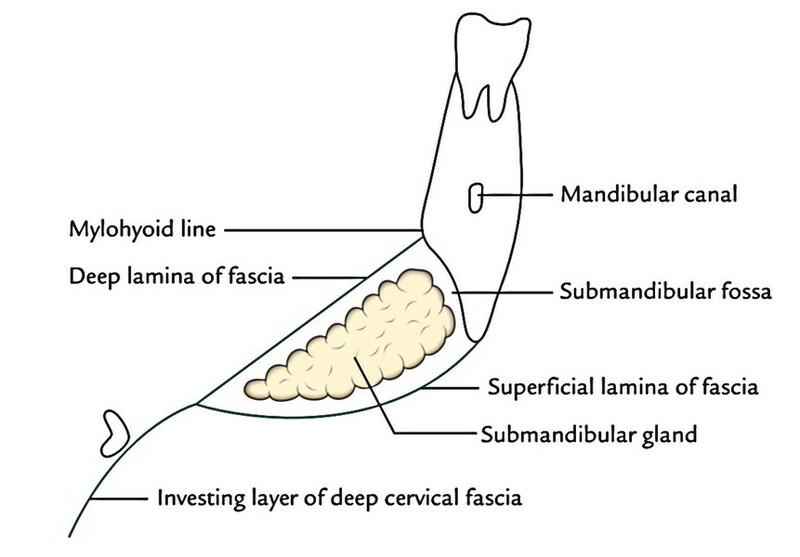 Submandibular fossa on the inner aspect of the body of mandible. Medial pterygoid muscle (near its insertion). It’s significant to notice the facial artery loops downwards and forwards between the bone and the gland and after that winds around the lower border of the body of the mandible at the anteroinferior angle of the mandible to get to the face. 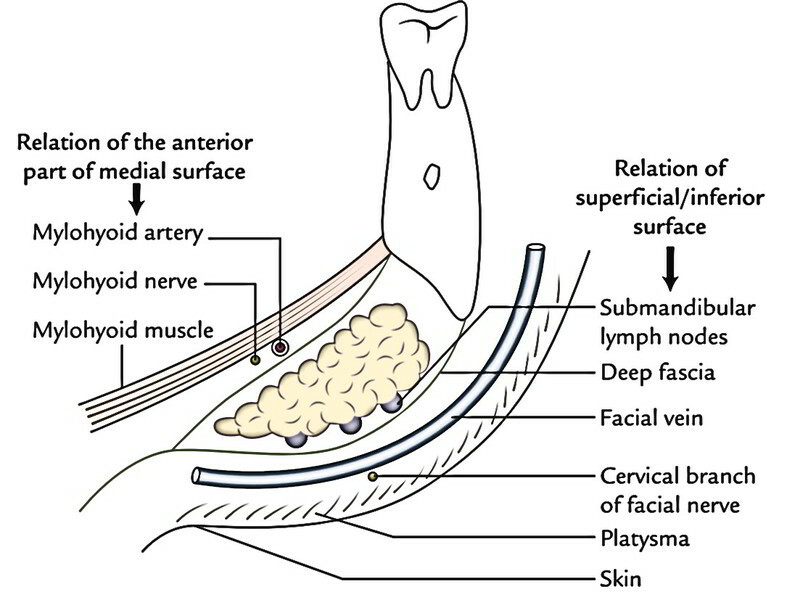 Submental branch of facial artery. 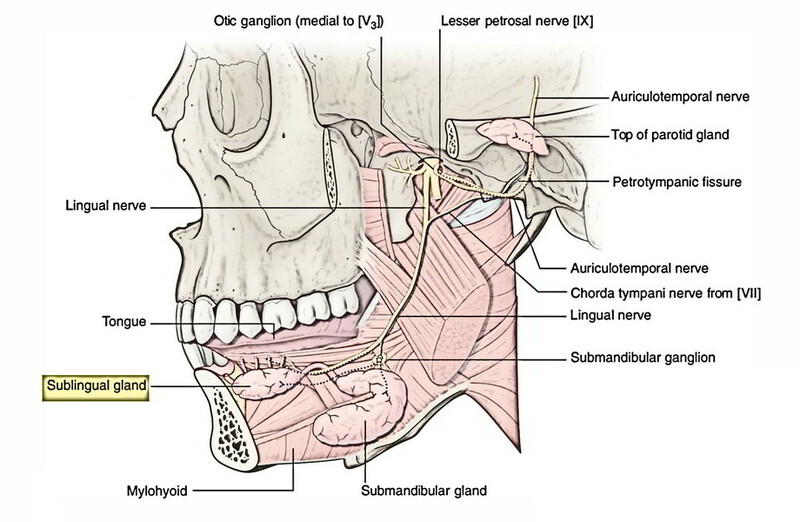 Superior: Lingual nerve and submandibular ganglion. Inferior: Hypoglossal nerve escorted by a pair of veins (Venae comitantes nervi hypoglossi). The submandibular duct is all about 5 cm long and appears at the anterior end of the deep part. It runs forwards on the hyoglossus between the lingual and hypoglossal nerves. 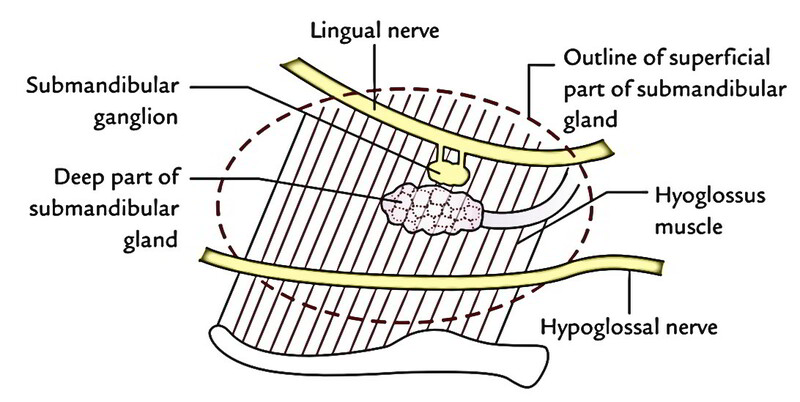 Near the anterior border of the hyoglossus, it’s crossed by lingual nerve. It continues running forwards between the sublingual gland and the genioglossus. Here it is located just deep to the mucus membrane of the oral cavity. Eventually, it opens into the oral cavity on the peak of a sublingual papilla in the side of the frenulum of the tongue. The gland is supplied by sublingual and submental arteries and emptied by common facial and lingual veins. Structures creating the connections of posterior part of medial deep surface. 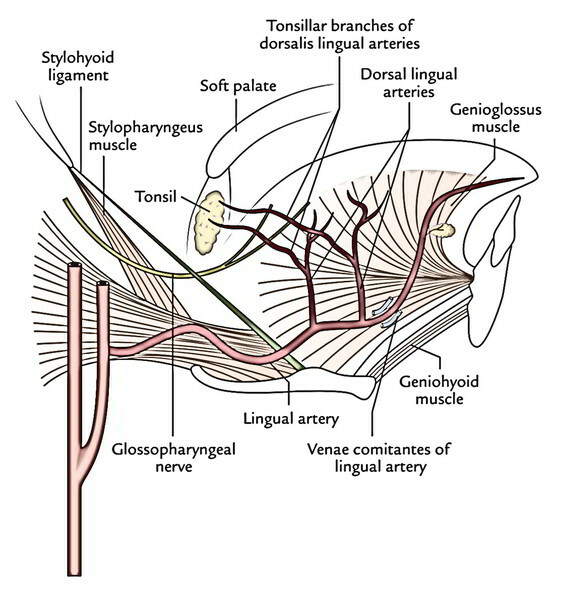 The preganglionic parasympathetic fibres originate from superior salivatory nucleus in the pons and pass successively via facial, chorda tympani and lingual nerves; and terminate in the submandibular ganglion, which acts as a relay station. Sympathetic supply: The preganglionic fibres originate from T1 spinal section and goes into the cervical sympathetic trunk to relay in its superior cervical sympathetic ganglion. 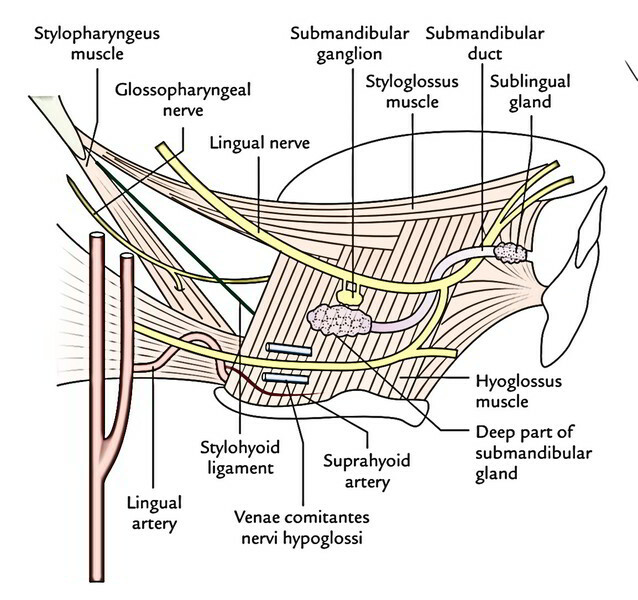 The postganglionic fibres originate from superior cervical sympathetic ganglion, create plexus around facial artery and therefore reach gland via this artery. Sensory Supply: The gland gets its Sensory Supply by the lingual nerve. Before it was believed that only parasympathetic supply is secretomotor and sympathetic supply is vasomotor. Now it’s created without doubt that both parasympathetic and sympathetic supplies are secretomotor. Parasympathetic stimulation generates watery secretion on the other hand sympathetic stimulus creates tacky mucus abundant secretion. Furthermore, sympathetic supply is vasomotor. Its secretion is more viscid. Its duct takes a tortuous and upward course, which hampers its simple drainage (against gravity) into the floor of the mouth. The excision of the submandibular gland for calculus or tumor is done by skin incision below the angle of the mandible. Since the marginal mandibular branch of facial nerve enters 1 inch posteroinferior to the angle of the mandible before crossing its lower border, the incision so ought to be given 4 cm below the angle to prevent injury to this nerve. The swellings of the submandibular gland can be felt bimanually by placing an index finger in the mouth and thumb below the angle of the jaw in regard to the position of gland, because part of the gland is located in the oral cavity above the floor of the mouth and part outside the oral cavity below the floor of the mouth. The submandibular lymph nodes being located on the face of the gland can’t be felt bimanually as they are located below the floor of the mouth (oral diaphragm). So an enlarged submandibular gland can be identified from a bulk of the submandibular lymph nodes by bimanual palpation. The stone in the submandibular duct can also be felt manually inside the mouth and can even be viewed if adequately large. The stone is removed from inside the mouth by incising the mucus membrane and duct over the stone. It’s a parasympathetic ganglion, which acts as a relay station for secretomotor fibres supplying the submandibular and sublingual salivary glands. Topographically, it’s linked to the trigeminal nerve (lingual nerve) but functionally it’s related to the facial nerve (via its chorda tympani branch). This ganglion is of the size of a pinhead and situated on the outer surface of the hyoglossus muscle. It’s suspended from lingual nerve by 2 twigs. The proximal twig is afferent to the ganglion and distal root is efferent to the ganglion. Lateral: Submandibular gland (superficial part). 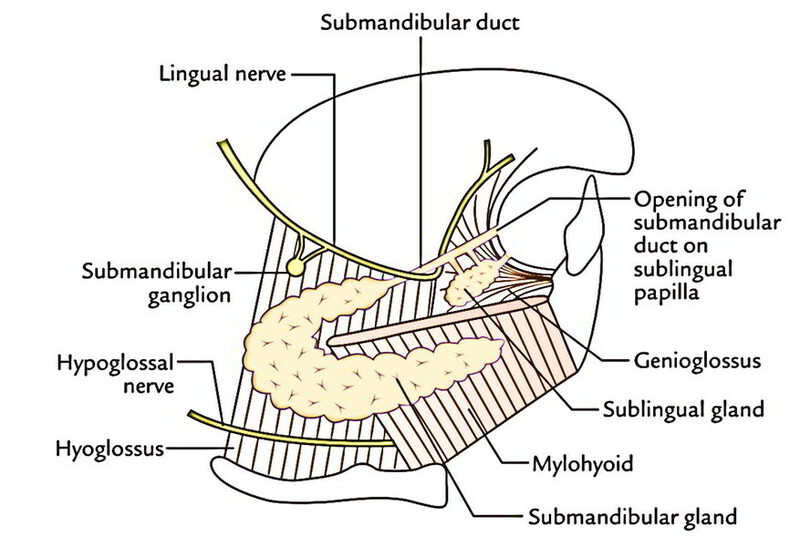 The submandibular ganglion has 3 roots, viz. : parasympathetic, sympathetic and sensory. Sympathetic root: It’s originated from sympathetic plexus around the facial artery. The preganglionic fibres originate from the very first thoracic spinal segment (T1) and goes into the cervical sympathetic chain to relay in superior ganglion. 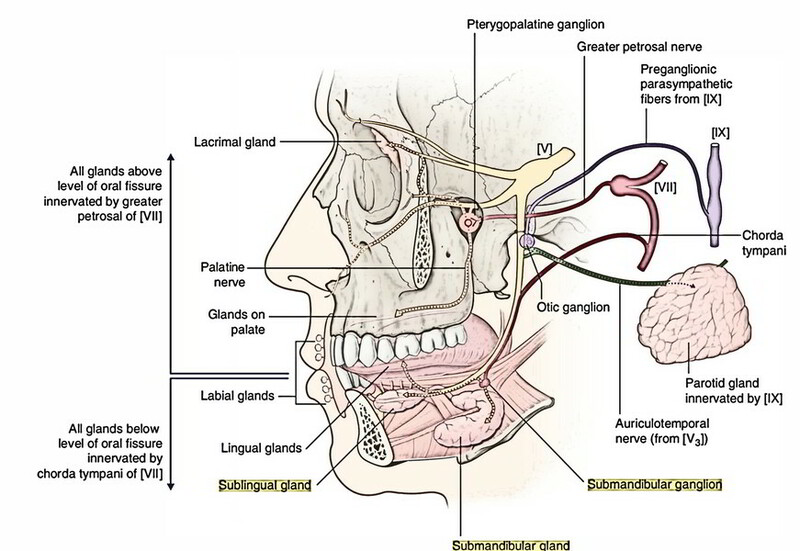 The postganglionic fibres originate from superior cervical sympathetic ganglion, create plexus around the facial artery to go through the ganglion without relay and supply the blood vessels in the submandibular and sublingual salivary glands. Sensory root: It’s originated from lingual nerve. Other fibres join the lingual nerve to supply the sublingual and anterior lingual glands. During surgery in the submandibular region, the incision is given about 4 cm below the mandible. After giving incision, a surgeon must bear in mind that deep structures in this region are ordered in 4 muscular planes. 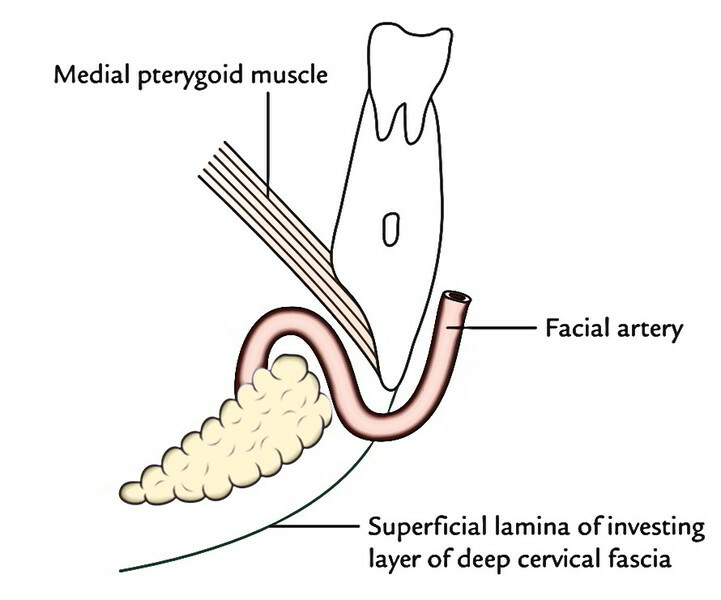 These structures are already described under the portion on muscles of the submandibular region. Nevertheless, for an overview and ease of understanding these planes are summarized in the subsequent text. The major structures in this are (a) digastric muscle and (b) majority of the superficial part of the submandibular gland. The submandibular lymph nodes are located in close relationship to the submandibular gland and are partially concealed under the body of the mandible. Notice that superficial part of the submandibular gland partially overlaps both anterior and posterior bellies of the digastric muscle. The facial artery appears on face by winding around the lower border of the mandible. The major structures in this plane are (a) mylohyoid muscle and (b) mylohyoid nerve and vessels appear from under cover of the mandible. There’s also a large submental branch of the facial artery. 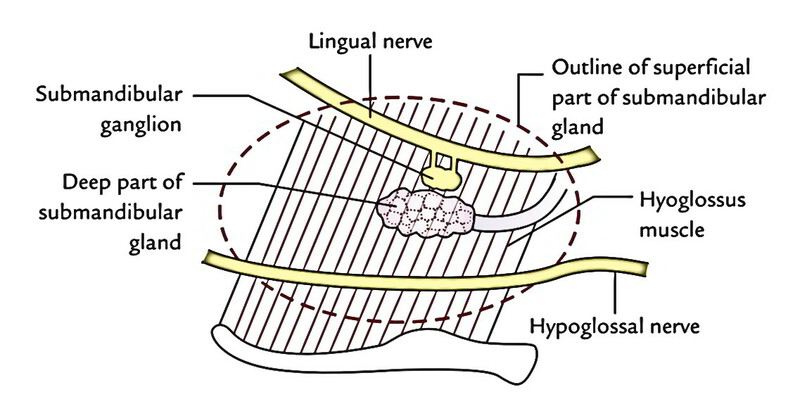 The hypoglossal nerve runs horizontally forwards on hyoglossus escorted by venae comitantes nervihypoglossi. 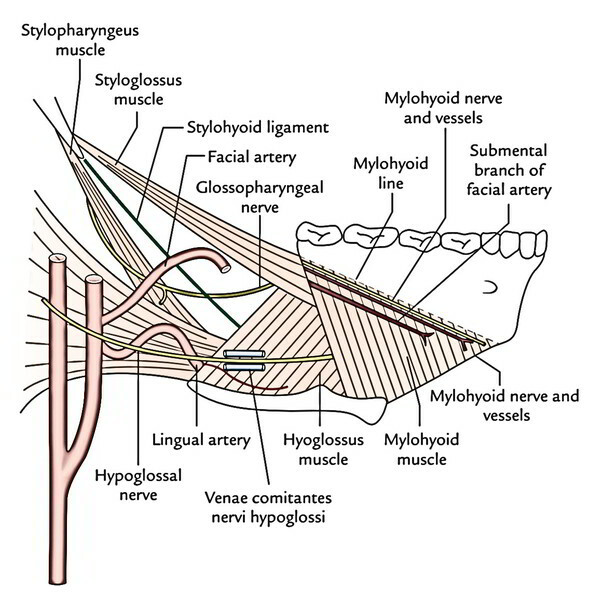 The major structures in this plane are (a) lingual and hypoglossal nerves, which convey with every other near the anterior border of hyoglossus, (b) deep part of thesubmandibular gland and submandibular duct, (c) submandibular ganglion and (d) styloglossus muscle being crossed superficially by the lingual nerve. Notice the double crossing of submandibular duct by lingual nerve. The structures passing deep to posterior border of hyoglossus are also viewed. The major structures in this plane are genioglossus muscle, middle constrictor of the pharynx and lingual artery and its branches of distribution are the key features of the plane. This is smallest of the 3 pairs of large salivary glands. It is located in the floor of the mouth between the mucus mem brane and the mylohyoid muscle. It is almond shaped and rests in the sublingual fossa of the mandible. It’s divided from the base of the tongue by the submandibular duct. It’s largely mucus in nature and weighs about 3-4 g. The gland pours its secretion by a series of ducts, about 15 in number, in the oral cavity on the sublingual fold, but a handful of them open into the submandibular duct. The gland truly possesses about 20 ducts. The majority of these ducts (ducts of Rivinus) open individually on the sublingual fold, while some ducts from anterior part of the gland unify to create the sublingual duct (duct of Bartholin), which opens into the submandibular duct. The gland is supplied by the sublingual and submental arteries. 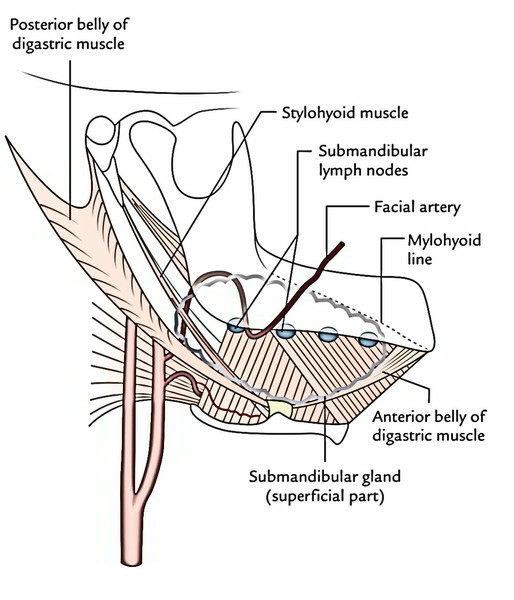 The lymphatics from the sublingual gland drain into submental and submandibular lymph nodes. A ranula is a large mucus retention cyst in the floor of mouth originating from sublingual salivary gland Somet imes it may originate from accessory salivary glands, termed glands of Blandin and Nuhn, present in the floor of mouth. The swelling is soft, bluish in color and transilluminates. It appears like the abdomen of frog (Rana hexadactyla), therefore the name ranula. The submandibular and sublingual glands grow as outgrowths from the endodermal lining of the floor of the mouth (at alveololingual sulcus). The submandibular gland originates from one large bud on the other hand sublingual gland originates from a series of small buds, which keep their relation to the floor of the mouth. Consequently the submandibular gland pours its secretion by just one duct and sublingual gland by several ducts in the floor of the mouth. The parotid gland grows as an outgrowth of ectodermal lining of the vestibule of the mouth.